Save Penwith Moors, West Cornwall. A Cornish farmer gives his views on H.L.S. - Horse and rider friendly work has been done in West Cornwall under H.L.S. especially at Ninnis and Mulfra Hill and Old Bosiliak. - We have pedigree Dartmoor and Shetland Ponies which will, and have been used on several West Cornwall conservation sites, not only Moors but coastal Dune sites. H.L.S. in our area is giving a much needed market and value to Dartmoor Ponies. I was born in 1953 and brought up on the family farm at Bosulval near Penzance, my family also farmed at Ninnes and Bosporthennis, I have been involved in the Dairy industry and local farms all of my life. I am old enough to remember the "old " ways of farming in Penwith and young enough to be deeply involved (as a farmer and conservation contractor) in the many Higher Level Stewardship( H.L.S.) schemes which are now beginning to take shape and come to fruition in Penwith. Recognising an opportunity in providing a service to local farmers, who were soon to sign up to 10 year H.L.S. agreements under the Heath Project, I set up my business "Gerald Babcock Rural Services" seven years ago. 7) CATTLE. The introduction of the critically rare breed Whitebred Shorthorn(W.S.) to the Penwith Moors , please go to www. whitebredshorthorn.com . , click on "features" and then "Pendeen and Trenow W.S. and" W.S.to graze Penwith Moors". The W.S attributes make it a perfect replacement for the now extinct Cornish Black . 8) PONIES. The introduction of Pedigree and Heritage rare breed Dartmoor Pony to the Penwith Moors. As on Dartmoor they are threatened by cross breeding with other breeds and in-breeding in themselves. Our activities enable our farmer customers to fulfil the H.L.S. 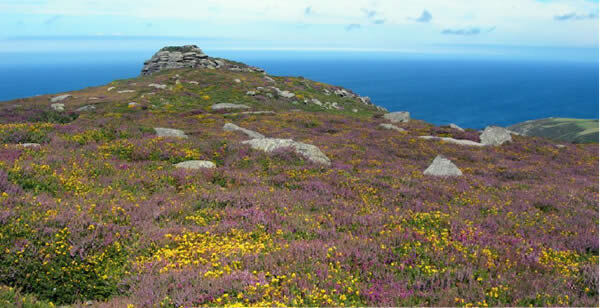 prescriptions written into their ten year agreements with Natural England, which in turn boosts the Penwith's beleaguered Rural Economy , encourages Bio Diversity on our Moors,open ups Public Access and in so doing boosts our Tourist Industry. Going back to the end of the last Ice Age, Penwith was then sparsely populated by wandering Hunter Gatherers who soon discovered that it was easier way of life to make their pray stay in one place ,or come to them, by providing grazing, so farming was born. Gradually, with the increase in human population, the land was cleared , small farms were formed and Cornish Hedges built creating our ancient field systems and tracts, many of which disappeared in the 1950's to 1970's due to post war Government agricultural policy encouraging farmers to make U.K. self sufficient in food..
Luckily a change of policy occurred in the 1980's with E.S.A. (Enviromentaly Sensitive Area) which saved our landscape for future generations.Without E.S.A., our Heathlands or Moors and old field systems would have been lost forever . Another very significant change to our landscape, farms and economy was caused by the Railway coming to Penzance in the 1850's. Pre this date farms were mostly self sufficient, supporting poor families on these smallholdings and relying on Cornish Black cattle. The changes I have whitnessed in our Penwith lanscape, economy and community ( in my 59 years ) has been breathtaking. Some for the good and some otherwise -especially in the very worrying loss of much of our wild life, but thankfully, many organisations that support conservation projects, like H.L.S., have the opportunity to correct this.